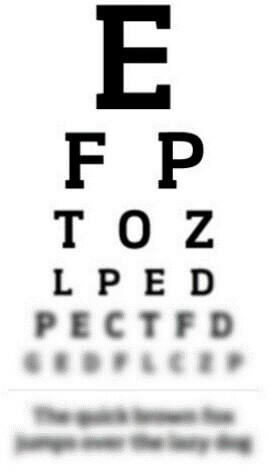 When you go to an optician, you look at a letter chart. If you have a loss of vision, you may not be able to read the lower lines of smaller letters, because they become blurry. Your eyes can’t focus on them. Another good way to understand it is to think of aging. Our eyes gradually lose their ability to focus up, so all nearby objects become blurry. All of the activities that require you to focus on something close to you – like reading – become more difficult. This loss of sensitivity to nearby objects does not vary; it is uniform. Our ears gradually lose the ability to hear high frequencies, both through damage and aging. However, in contrast to vision loss, the actual effects of this are not uniform. Speech is made up of many different frequencies and tones. If we can’t hear high pitched sounds, we find it hard to understand specific letters such as f, s and t. This is because they contain high frequencies. Such letters can also be drowned out by louder, low-pitched vowels like a, o and u. In contrast to vision loss, the loss of hearing sensitivity affects different parts of speech that are scattered throughout the conversation.